​Last NED Tournament of the year... 2015 Miller Pairs was held at Frick Park in Pittsburg, PA on Sat, Sept 12th and Sun, July 13th. After two days of on & off rain, all games were completed and two Frick Park teams finished first and third. Congratulations to the winners and all the participants! 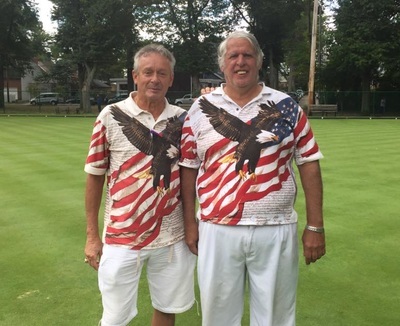 Twenty one bowlers from Rhode Island, Virgina, Maryland and Pennsilvania, New Jersey and New York, turned out at the Dupont Lawn Bowling Club on June 13 to play the 4th anual Ron Buck Singles tournament. It was a hot and steamy weekend uninterupted by rain. 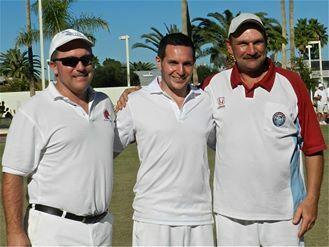 Each bowler played 6 games over the 2 days with 3 bowlers finishing at 6 wins and no losses. 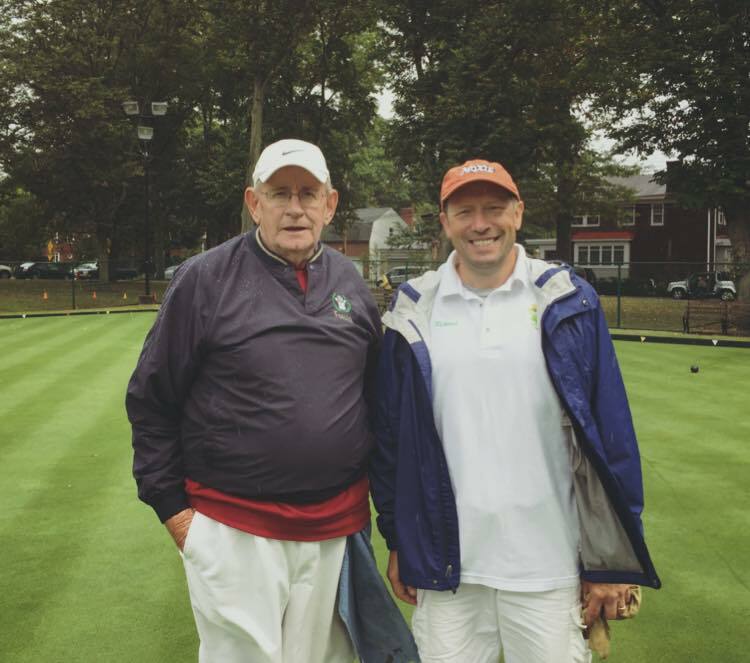 In the playoffs Patrick Duffy of Essex County defeated Joe Kelly of New York in the first game. He then went on to defeat Brian Drozd from Essex County in the final. Ryan Hastu finished in forth place with a record of 5 wins and 1 loss. 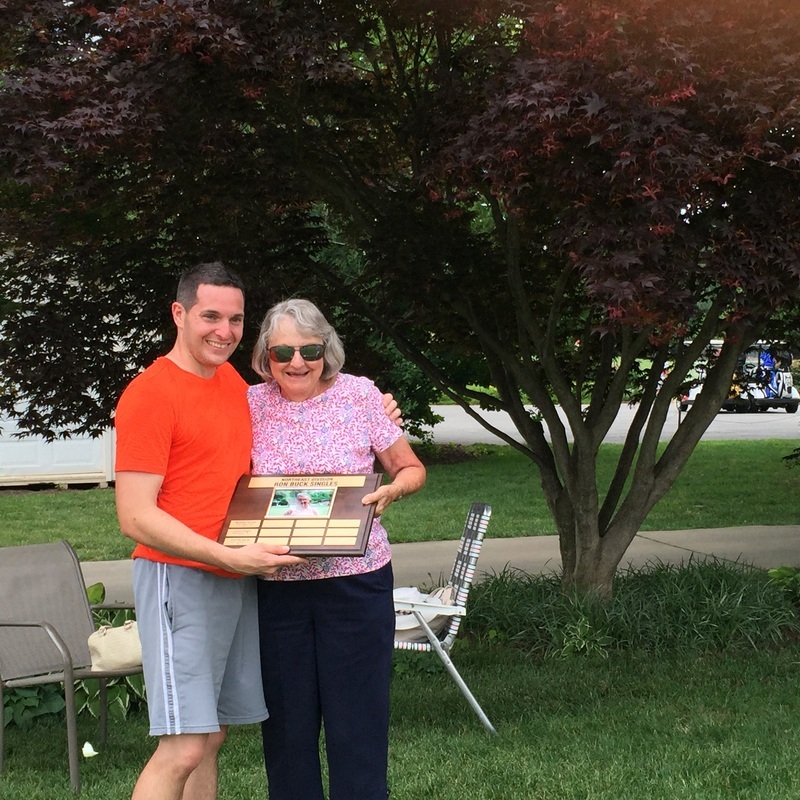 Betty Lou Buck presented Patrick Duffy with the trophy and prize money for the second consecutive year. Many thanks to the Dupont Club for their hospitality and congratulations to all of the participants. 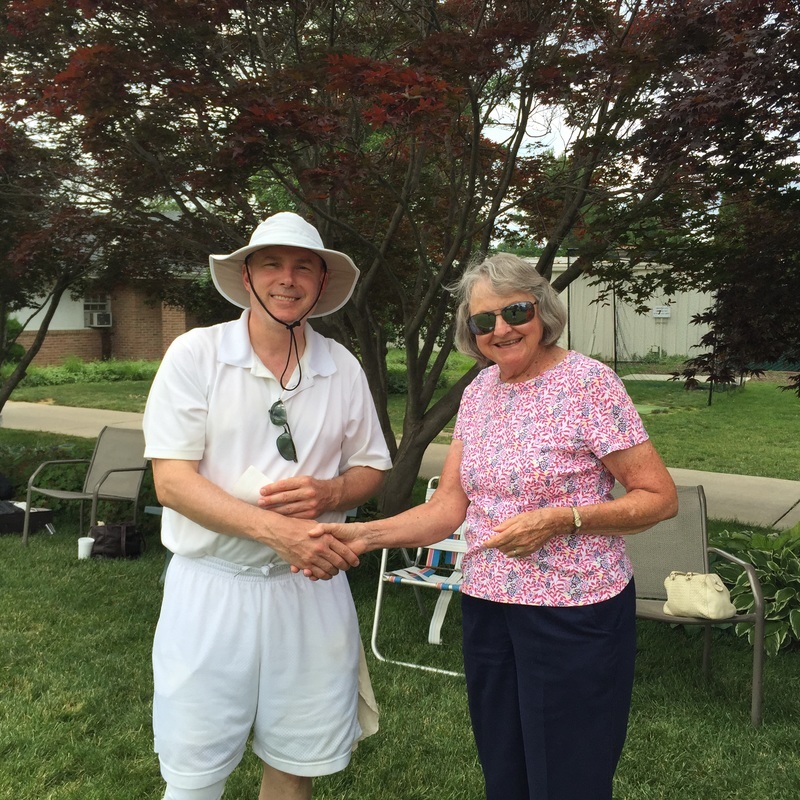 2015 Arculli Pairs – Duffy and Farrell win! 16 teams turned out at Essex County LBC on May 30-31 2015 for the Skip Arculli pairs. The tournament came to an abrupt halt when the weather turned to heavy thundershowers on Sunday afternoon. Unfortunately we were unable to complete the final round of play so the event was decided by the results from the first 4 rounds. There were 3 teams with a 4-0 record which required plus points ( max 9 per game ) and ends won to determine the winners. Patrick Duffy and Duncan Farrell (both ECLBC members) had a max plus 36 with 39 ends won out of a possible 48 to finish 1st. Burl & Barbara Roller (both ECLBC members) also had a max plus 36 points with 35 ends won for 2nd place. Last year’s winners, Colin Smith & Bob Patterson finished in 3rd place with plus points of 31 and 33 ends won. Michelle Arculli and Skip Arculli/Frances Shen finished in 4th place with 3 wins and a tie. This was the first time in the last 20 years that we have had to resort to tie breakers to determine the results of an event. 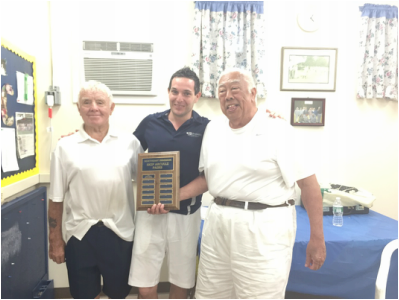 Winners of 2015 Arculli Pairs (l to r): Duncan Farrell and Patrick Duffy with Skip Arculli presenting their award. 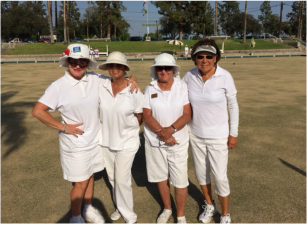 ECLBC member, Frances Shen recently played rinks with her partners, Joanne Kluck, Angie Peet and Katheleen Nesbitt in the Southwest Open in Santa Anita, CA and came in 4th place in the Championship flight. Congratulations to Frances and her teammates! 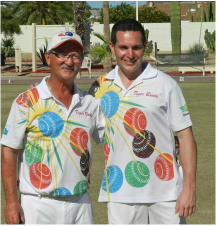 Congratulations to our own NED President and ECLBC member, Patrick Duffy and his team mates for winning in both Triples and Pairs at the South Central Division Open hosted in Sun City, AZ this past February.